Bandar Seri Begawan, 3 October 2012 - EXTENDED families are an ideal platform for inculcating positive values, said Deputy Minister of Culture, Youth and Sports during the Country Presentation Session of the 5th East Asia Ministerial Forum on Families (EAMFF). "The extended family system provides the traditional support system and emphasises on interdependency and support among family members." Datin Paduka Hjh Adina Othman (pic) said in her presentation. "It provides a good environment for each family member to realise their responsibilities responsibilities as a parent, child, grandparent, aunt, uncle and so on." She added that "It is an ideal platform for inculcating positive values. These are significant factors in upholding the family stability, strong community and cohesive society." She said that in a close-knit community like Brunei, where family values are integral to the moral fabric of the Bruneian society, "We uphold the importance of family and the significant role it plays for the well being of each member of society." She noted that with a population of 393,162, "Brunei Darussalam is home to 68,208 households nation wide, with the average family size of 5.8 in 2011". She pointed out that the extended family structure remains common throughout the country, where "parents, grandparents, uncles and aunts can be found living under one roof". The deputy minister also reiterated that Brunei government has a high priority to strengthen the family institution, which included adopting a National Plan of Action, approved by a special commitee on Family Institution and Women. The Plan of Action acknowledged that "Work and Family Balance" is an important agenda and had set out programmes such as enhancing parenting skills, communication skills, time and financial management as a means to address Work-Family balance, she said. "Other programmes include promoting family friendly centres at the workplace, awareness campaigns on the responsbilities of each member of the family, health awareness campaigns, regular surveys on the status of families and enhancing the school curriculum on the family institution and the mindset of the community," she added. The deputy minister also highlighted that Brunei celebrates National Family Day as a recognition of the importance of a family. She also said that the extension of Hari Raya holidays (from two days to three days) starting from this year by His Majesty reinforced further the need to spend quality time with the family. 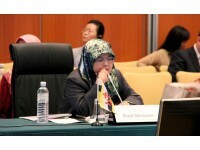 She also shared with other delegates some of the provisions Brunei had made to assist with the wellbeing of families and promoting work-family balance which include free healthcare and education, allowances for leave in various circumstances including Haj, accompanying a relative for medical treatment and 105 days maternity leave for working mothers. "In terms of family responsbilities on the care of the elderly, Brunei Darussalam with its extended family system provides a good environment for such care," she said.